Body is muslin that is done with a staining technique. Her icing is painted on. 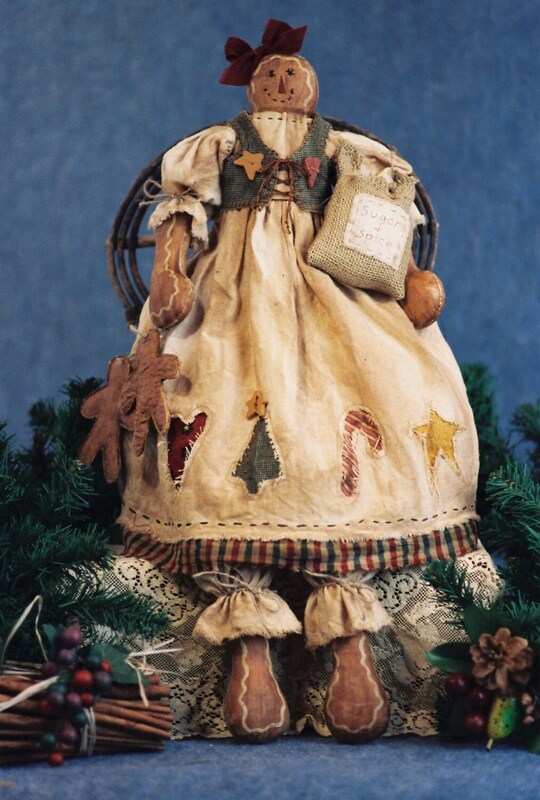 Her dress is adorned with reverse appliques and wood stars and heart. Her vest is laced together at the front. Instructions for sack and gingerbread cookies also included. Easy to make. Excellent for craft fairs or decorating your Holiday kitchen. Instant PDF download includes easy to follow instructions, doll pattern, clothing pattern and complete suggested materials list. All patterns are delightful. Thank you. love it!!! will purchase more in the future. Love it!! Can't wait to make it. Thanks for sharing your wonderful talent. God Bless! !